This holiday season Amazon is promoting their largest Android app giveaway in the history of the Amazon appstore. 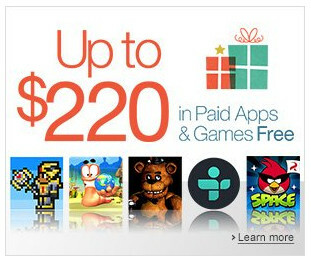 From December 24 through December 26th, you can get $220 worth of paid Android apps for free. The bundle giveaway includes a number of games such as Angry Birds and some old school games like Sonic and Tetris. There are some handy utility apps too like Calculator Pro, Root Explorer, and Splashtop Remote Desktop. And don’t forget today’s free app of the day, Dr. Seuss’s classic How The Grinch Stole Christmas. It’s an interactive ebook complete with professional narration and custom sound effects.